Alhaji Issahaku Mahama is the founder and CEO of Tiyumtaba Farms and Investments Limited. He has previously worked as Member of Parliament for Gushegu Constituency from 1993 to 1996. He currently works as a chairman of the Seed Producers Association of Ghana, Northern Region branch. He has had two awards as best Rice Seed Farmer and Best soybean farmer in 2000 and 2003 respectively. 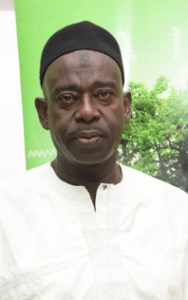 With years of experience in producing certified seed for farmers across the country, Alhaji Issahaku Mahama got the motivation to establish Tiyumtaba farms and investment limited to serve as a platform to promote the availability, distribution, and utilization of climate-smart and resilient crops to the Ghanaian farmer. Tiyumtaba Farms and Investment Limited serves as a platform to promote the availability, distribution and utilization of climate-smart and resilient crops to the Ghanaian farmer. Tiyumtaba’s core objectives are- to promote the production of climate resilient seed, which are drought tolerant, early maturing, and resistance to shattering and lodging among others, to promote the adoption of improved climate resilient seed among farmers in the Savanna area of Ghana and to partner with relevant stakeholders in transferring sustainable agricultural practices to farmers. Tiyumtaba also produces and supplies seed to various actors along the agriculture value chain such as the government, NGO’s, processers, and commercial farmers.